This field of view shows the large lenticular galaxy M85, the spiral galaxy NGC 4394 (left of M85) and the dwarf lenticular galaxy IC 3292 to the right of M85. 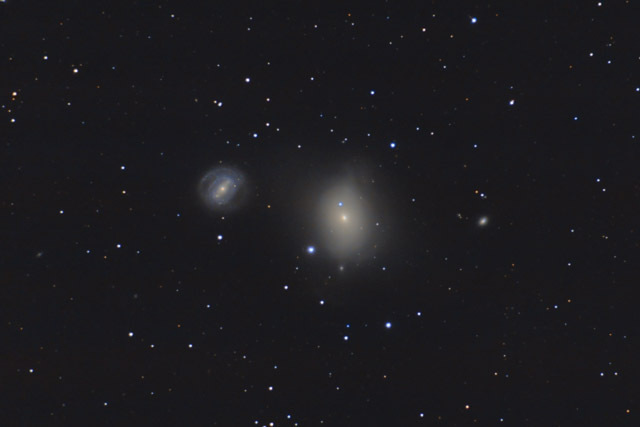 Lenticular galaxies such as M85 and IC 3292 probably represent the transitional phase between spiral galaxies and elliptical galaxies. Much like spiral galaxies, lenticular galaxies typically have a brighter nucleus surrounded by an extended halo. However, unlike spiral galaxies, lenticular galaxies do not have well defined spiral arms. One of the unusual things about this image is that you can readily see numerous globular clusters surrounding M85. The globular clusters look like stars, but a closer view will show that they are a little bit fuzzy looking. Additionally, careful inspection of the image will reveal a number of background galaxies. In this photo, North is Up. This image is cropped to 60% of the original full frame. Software Used Images Plus 5.0 for camera control, IP 5.5 Beta for calibration, stacking, digital development, star shrinking and halo reduction, smoothing and noise reduction, advanced Lucy-Richardson deconvolution, and multiresolution sharpening. Photoshop CS5 used for levels and curves, high pass filter, star shrinking, screen mask invert, lab color, saturation adjustments, selective color, vibrance, and lens correction. Gradient Xterminator for gradient removal. Carboni Tools for additional noise reduction, and smoothing. HLVG for additional color correction. Registar for aligning stacks and composites and for color channel alignment. Notes Lenticular and elliptical galaxies don't make for the most exciting images. However, capturing M85's globulars as well as some good detail in NGC 4394 helped to make this image a little more worthwhile to me. Oh well, I guess they can't all be wall hangers!